In this article we will go over how to use the Tablet Production Report. 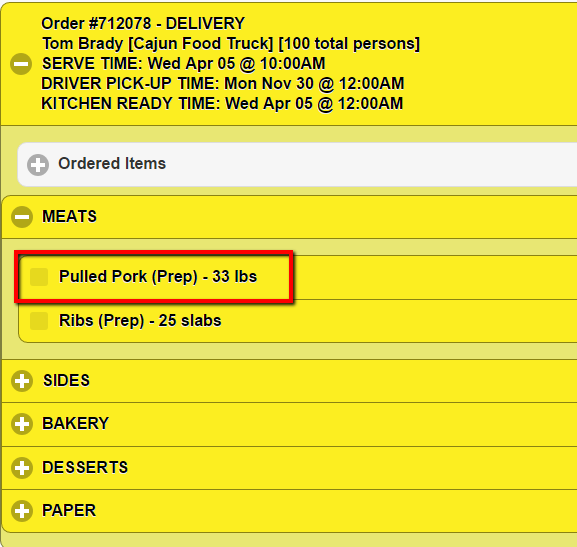 This report is a great way to make sure that all the menu items have been prepped properly. Our clients might use the Tablet Report verses printing out the Food Prep Reports. CaterZen clients in the past have found that using the tablet reports helps in several different ways. One at any point in time a manager can look to see what menu items have been prepped for the day's upcoming orders. Two the kitchen staff likes having all the order prepping in one place instead of on several pieces of paper that can easily be lost. Three you can have a tablet at each station. Then that station can focus on the just the food that they need to be prepping. The last feature I want to mention is the updating feature. 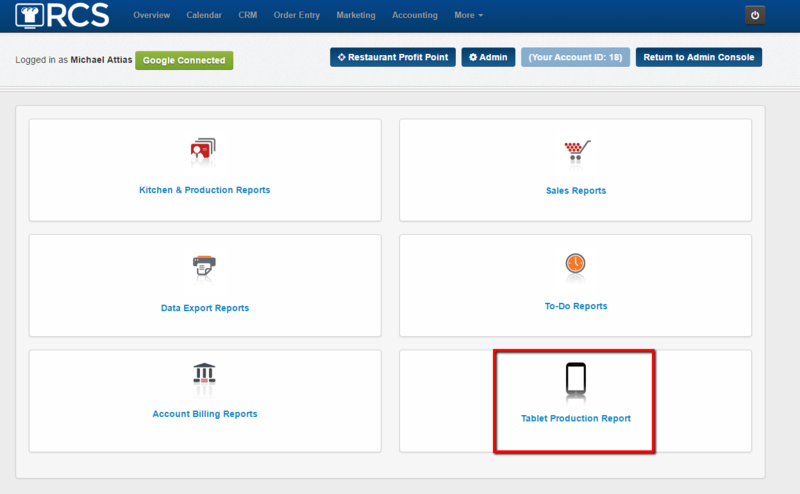 If your kitchen is working on an order and the customer happens to call in and make a change (for example change the order from 50 people to 75 people) - then once the order has been changed in CaterZen the tablet report will let you know immediately that it has been changed. The order will flash to the color red and the previous totals will be crossed out and the new totals will appear. We recommend you purchasing a cheaper tablet to keep in the kitchen. We also recommend that you purchase a stylist for the staff to use when working with the tablet production report. This will help keep the tablet clean when your staff's hands our messy. 1 - Click on the More tab and then click on the Reports link. 3 - The next page you will see will be the page to make specific choices. Below is a description of each choice. 4 - Once you have made your selections click on the Show Report tab. 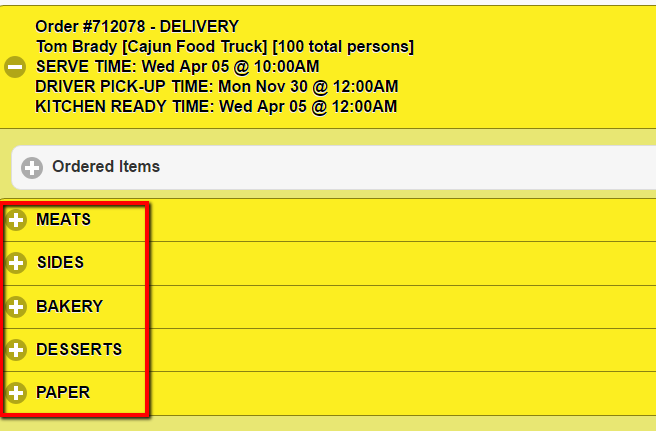 5 - The next page that will appear will show you each order in Yellow at the top. 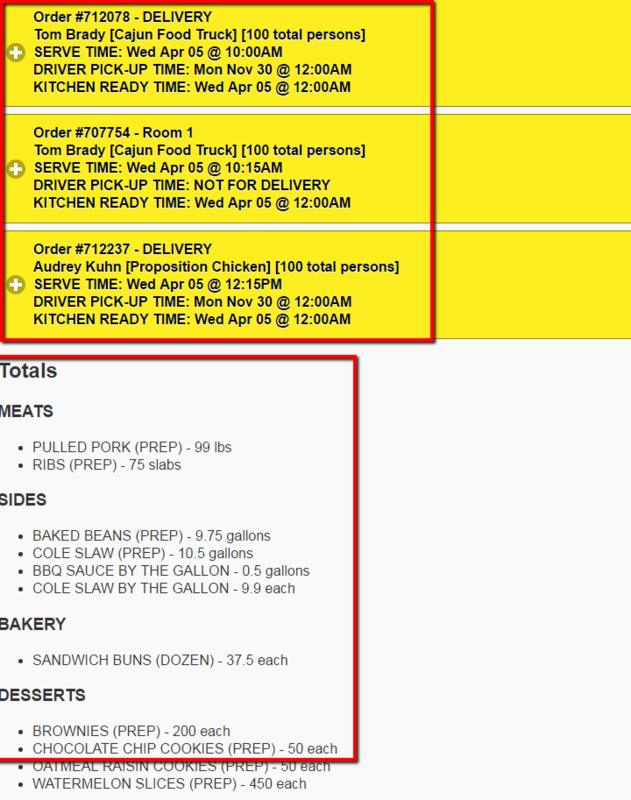 Below will be a Total of the all the menu prep items that are needed for all the orders. They are broken into food categories. This next section will go over how to start prepping for a specific order. and the menu items that were ordered will appear with choices. 6 - Click on the Order you want to work with. 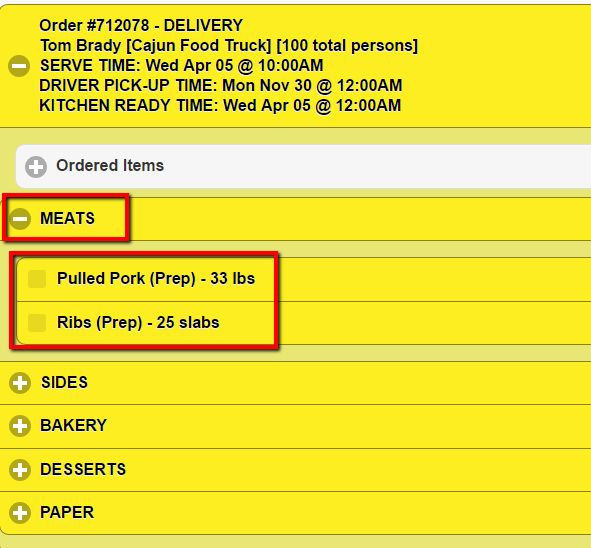 7 - Next you will see the Categories for each menu item that needs to be prepped. 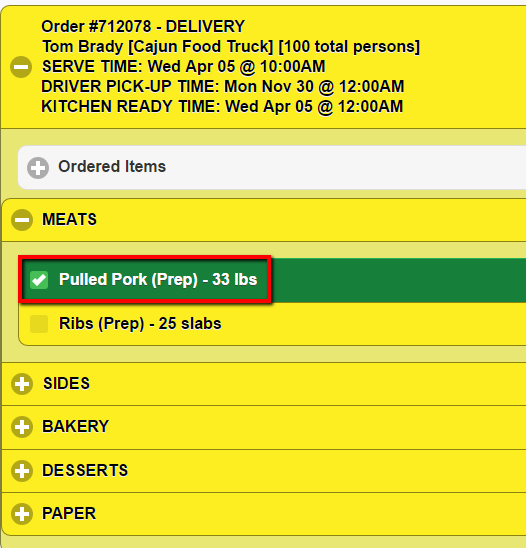 9 - Once you have finished prepping and packing a menu item you can click on the Menu Item that has been completed. 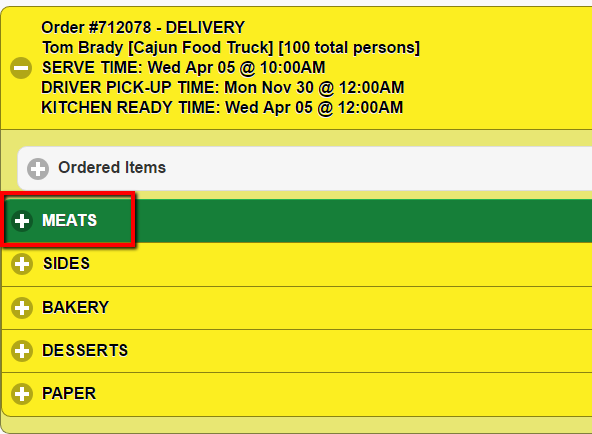 You will notice once you click on the menu item it will turn Green and a Check Mark will appear. 10 - You will want to take these Same Steps with each Menu Item. Once all the Menu Items in a Category have been completed the color of the Category will change to Green. 11 - You will take the same steps for each category and menu item. Once all Categories and Menu Items have been completed the order will turn to Green and you can move on to the next order. 12 - If you are working on an order and the client calls in to make a change to the order the kitchen will be notified of the change if the Tablet Production Report is open. Also if a new order has been placed then the new order will appear in the Table Production Report. 13 - The first thing that will appear will be a Pop Up box letting you know the order has been changed. 14 - Then the order will start to Flash in Red. The New order will flash in Red as well. 15 - You will also notice that the quantities for the totals a the bottom will Change. The Original quantities will be crossed off and the New quantities will show. 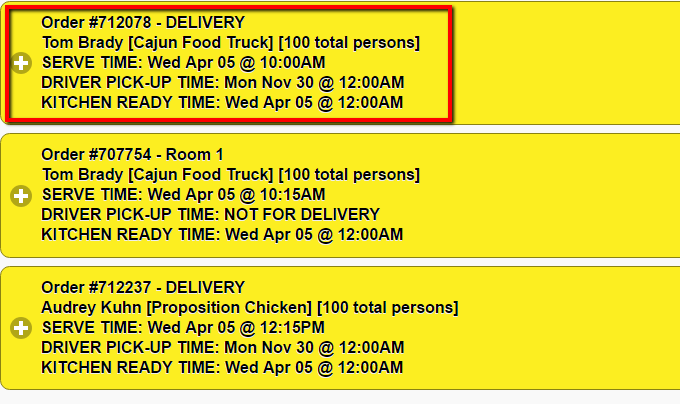 16 - Once you click on the Flashing Order the Order will go back to All Yellow. 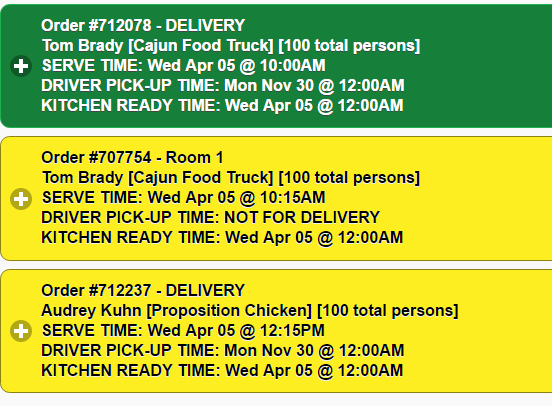 Then prompting the kitchen that this order has had a change. You have now learned how to find and use your Tablet Production report. A great way to make sure your kitchen is prepping the correct amount of food and not print on paper.